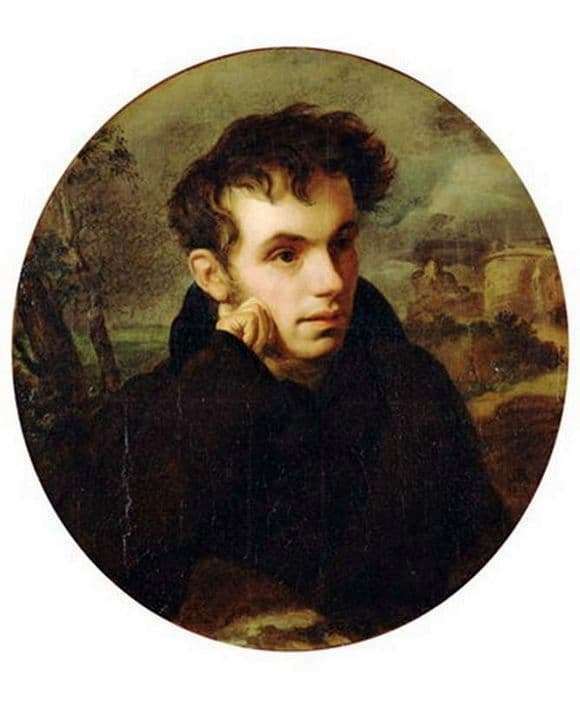 Kiprensky wrote this portrait quickly. At this time, Zhukovsky was just about to leave for the sun-drenched Italy. Researchers say that this picture was not completed. The customer specifically asked not to add the left hand. This was done in order to convey inspiration and creative impulse. The painter depicts Zhukovsky on a favorite background. We see a mysterious night, a ruined tower, a fabulous silhouette. The poet looks somewhere ahead, but at the same time you feel his immersion in his own thoughts. Kiprensky portrays the poet in a pose that gives him a dreamer, who seeks, by all means to catch the wonderful music of various spheres. Zhukovsky stands above the usual life. He was associated with the miraculous. This can be felt if we look in detail at the portrait of Kiprensky. It seems that the poet is listening to the fabulous voices of nature itself. It seems that all the secrets of this bizarre world are subject only to him. In this picture is dominated by brown and pastel colors. The artist highlights the face of Zhukovsky. It is as if illuminated by the sun. The whole portrait is impressive not by the riot of colors, but by the power of the transfer of the character of the poet and his thoughts. The artist managed to understand this man and create a truly spiritual picture. The canvas is so vivid and deep that it remains only to be surprised at such mastery of Kiprensky. We can feel that the artist really liked to paint this portrait. In his work of tremendous strength, he invested incredible talent and genuine skill. At the same time, it is clear that the painter was sympathetic to Zhukovsky. The poet himself also liked the picture. Thanks to the picture of Kiprensky, we can present not only what Zhukovsky looked like, but also understand many of his works.